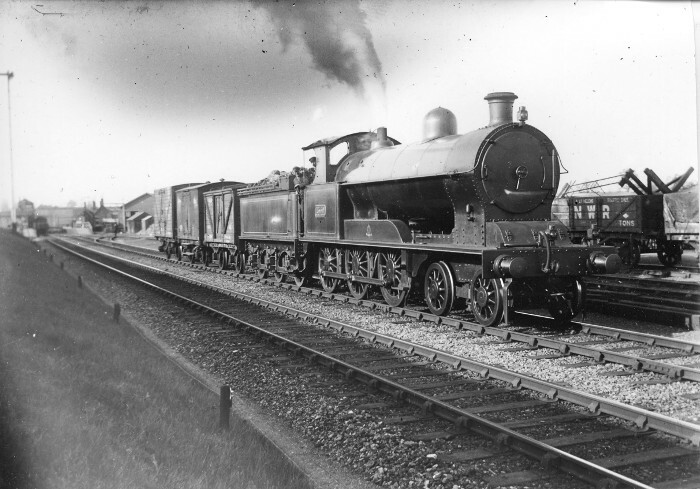 George Whale’s 19in Goods 4-6-0 with a short goods train — appears to be in LNWR days. Does anyone know When or where though ? This is not a train because there is no break van, so the engine is shunting. The first van is an LNWR D33 or possibly D32 roof door van. The second is not LNWR. The third is an LNWR D88. Of more interest to wagon enthusiasts is the 4-plank behind the engine which is one of the very few allocated to Garston, Widnes and St.Helens, though I would love to know what it is carrying. My print of this picture came from the late Geoff Platt and he wrote on the back that it was No.1350 at North Kilworth which is in Leicestershire and makes the “... St. Helens only” branded wagon all the more curious. The print is more heavily cropped however with very little background, so how he knew that I have no idea. He also wrote that it was taken by A.F.Shoults in c1912. I have never heard of North Kilworth, and it is not listed in my Handbook of Railway Stations. My own picture of Welford & Killworth station taken in 1965 seems to confirm the location with everything looking to be a match. Scan attached. (see 'larger photo'). Welford & Kilworth station, on the Rugby to Market Harborough line, was opened on 1st May 1850 as Welford, and (according to Clinker) was renamed Welford & Kilworth by April 1855, Welford & Lutterworth on 1st May 1897, then back to Welford & Kilworth on 13th January 1913. Although the village of North Kilworth is nearby, the station was not actually so named. Perhaps the explanation is that the photographer A. F. Shoults was living there around 1912. Photo GDWP DP1673 in society collection has caption - 0-6-0 18"Goods Cauliflower. Leicestershire. Welford & Kilworth. Unidentified. On an Up train of four 6-wheeled carriages, from Peterborough to Rugby. Approaching the station and running across the trailing crossover for a siding on the left. Perhaps taken from a signalbox. Very tall Up Home signal beyond train. Welford & Kilworth. C1912. Photographer: A F Shoults. See Cauliflower Gallery on Zenfolio site. Harry Jack suggested that A F Shoults might have been living near Welford & Kilworth in 1912. The 1911 census shows an 18 year-old Alan Frederick Shoults working in his father�s nursery on Whetstone Road, Blaby, which is not so far away. Is this perhaps our photographer? Thanks, Jim. This A. F. Shoults seems likely, and whatever the distant station was called, the photo was taken in North Kilworth. There was a G. M. Shoults (some relation perhaps, a son or a brother?) in the Stephenson Loco Society in Manchester from 1949, as was Geoff Platt from 1943. Maybe Geoff Platt got the photo from him? The view is looking towards Market Harborough, so (by the shadows) must have been taken late in the day. I knew G.M.Shoults who was a member of the Manchester Model Railway Society (as was Geoff Platt) in the 1950s. He was the son of A.F.Shoults. Doubtless Geoff Platt got the photo from him.